It’s not even 10 and I’m bushed. 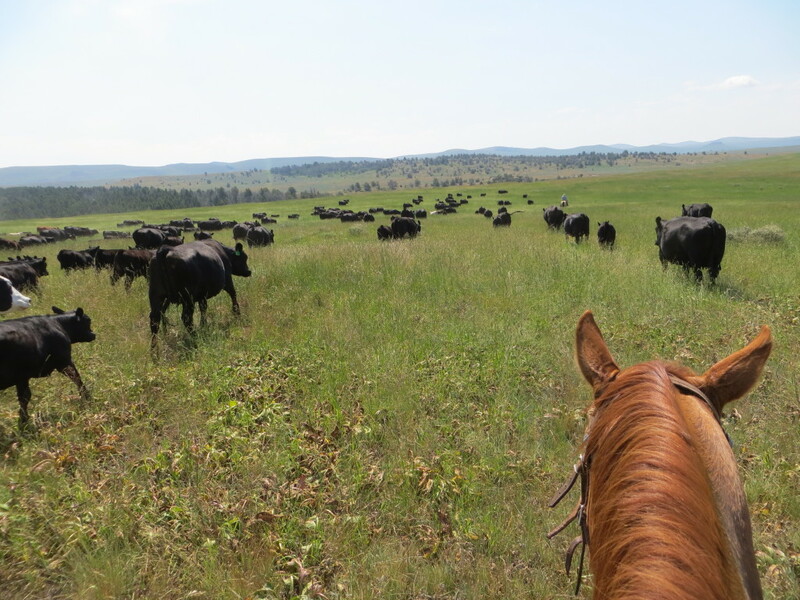 We moved those cows today, and it was very pretty and slightly cooler up on the mountain! The chance for rain was high, so we all packed our slickers, expecting to get rained on most of the day. Turns out, it only started raining when we finally were finished and off the hill about 5:30 pm! 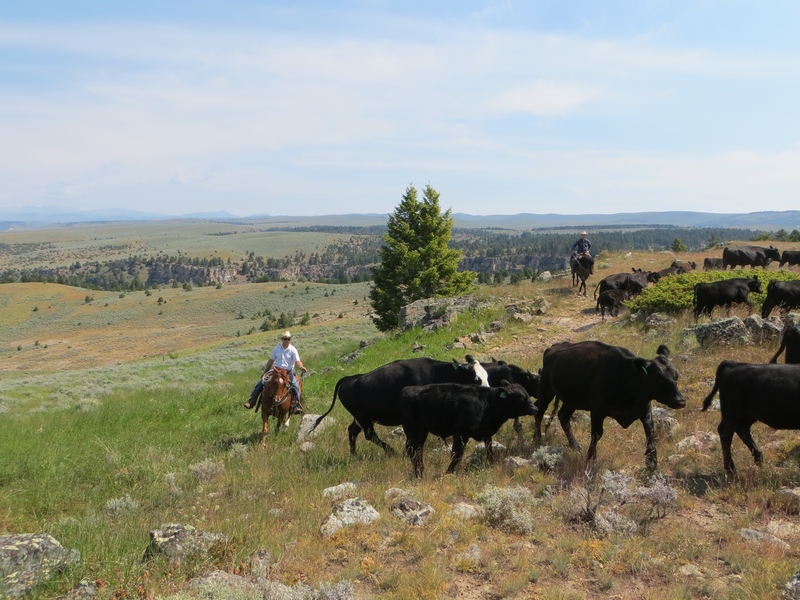 I got to see a little more country than usual… when trailing cattle, you don’t usually take scenic side trips… so today was the first day I’d seen over this one ridge! The view was nice, except for the smoky skies. Is Canada still burning??? and then trailed across a neighbor’s pasture. Isn’t it gorgeous? This is what happens with lots of work and effort… TONS of grass! 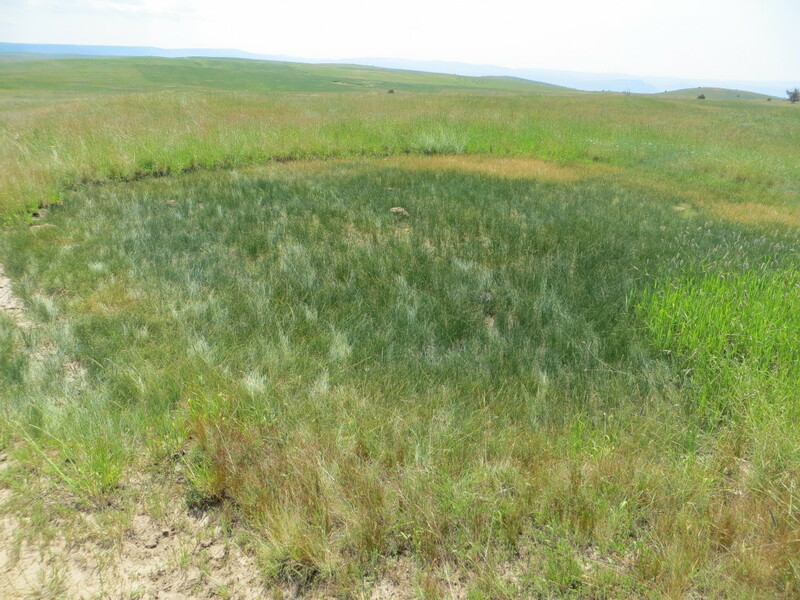 I’m still amazed at buffalo wallows… and how, over 100 years later, the soil composition and compaction makes for a different mini-ecosystem than the surrounding areas. 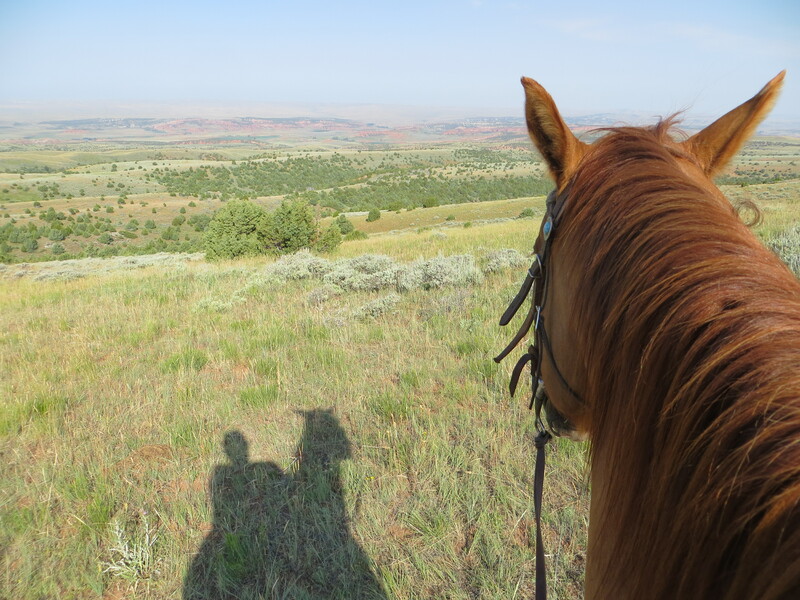 That’s the pretty version of today… the Real Version included cussing, run back calves, sweating horse, exhausted dog, frustration, anger, and many un-flattering things that came out of my mouth. Four calves ran back, and I was in position to go get them all. Panama is pooped. Dally gave up. I was terrified I’d overworked Dally and she was suffering somewhere and not coming to my calls. Turns out, she was back at the pickup laying in the shade… after trying to keep up with me chasing calves, she’d just wised up and headed “home”. It WAS a pretty day… and I was on horseback with my dog, but I still had to make that conscious decision to enjoy some small things, as most of of the big things included a wreck! That’s the life, though… and I’m still happy to live it! Beautiful country–you are a lucky gal! (Even if it is lots of hard work and frustration!) Thanks for sharing it with us to see. change horses/dogs for the next day, so they get somewhat of a rest? I love your blog, Carol. It’s always so interesting….and great pictures too. Thanks!!! I’m thinking that haze is from here in Washington. There’s a fire up by Lake Chelan, Mill Creek I believe. It’s supposed to reach 104 degrees here today so time to get things done outside before it’s unbearable! Even a bad day in your “office” looks great to me! Although I do realize I would never be able to hold up to that kind of work! (bad health…) Well, I for one, think you are amazing!